Alfield Soccer Club was founded in 1975 by Manfred C Muntwyler, the current club President. It has always competed in the Halton Peel Senior soccer league, which is a competitive over’s 30’s league in southern Ontario, Canada. The club is made up of players from all over the world, brought together by the love of soccer, up until 1993 the club fielded one team, but due to an expanding player membership a second team was formed and in 1998 the club had enough playing members to start a third team, giving the older players a place to keep playing at a less strenuous pace. In 1984 a team for all members was also entered into a local Thursday night league, Oakville MCM Carworx (Formerly Wurth) still compete in this same league today. 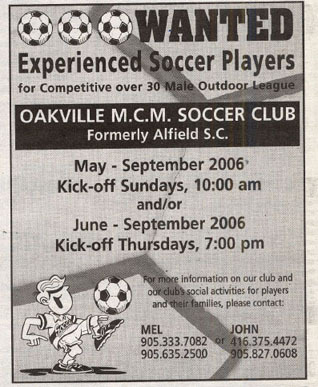 In 2004 the club name changed from Alfield to Oakville MCM (Manfred’s Initials). In 2005 the third team was dropped as several of the older players decided to retire but the third team made a return to the league in 2008. The club has become more then just a soccer club and for many of its members it is a focus of their social life. Families are welcomed into the fold as there is plenty happening off the pitch with several social events. The Club also celebrates 17 years of holding the pre season “Muntwyler Tournament” involving up to 10 local soccer clubs with all proceeds going to a local charity called “Ian Anderson House”. The club has been on several tours, in 1995 and 1998 tours were taken to England and in 2000 and 2002 the club went to Hungary. In 2005 the club was represented in the World Masters Games in Edmonton, Alberta Canada and these were followed by a tour to Charleston, South Carolina in 2006. In October 2008 the club undertook its most exciting tour yet with a trip to Switzerland, Manfred’s birthplace. The club went undefeated on its tour posting a solid 3 wins and 2 ties. In October 2010, we took the club to beautiful Madeira Portugal. The club faced stiff competition playing clubs from C.D. Nacional and C.S. Maritimo. On October 2012 took us to beautiful Cannes, France. The club competed against AS Cannes' team full of ex-professional former players. Our latest 2015 tour took us to Madrid and San Sebastian in Spain. The club enjoyed sun, pinchos and the best soccer competition yet. MCM played against some notable legends for Real Madrid and Atletico Madrid. Each of these tours were very successful on and off the pitch and helped to spread the good name of MCM soccer club around the world.